Add sunshine and happiness to your day with this stacking ring set in mixed metals inspired by the song You Are My Sunshine. A sweet jewelry gift to remind them their love will never be replaced and they are your reason to be happy in life. .925 Sterling silver rings measures 2.7mm. “You Are My Sunshine, My Only Sunshine” 14k rose gold plated ring is finished in a high polish. 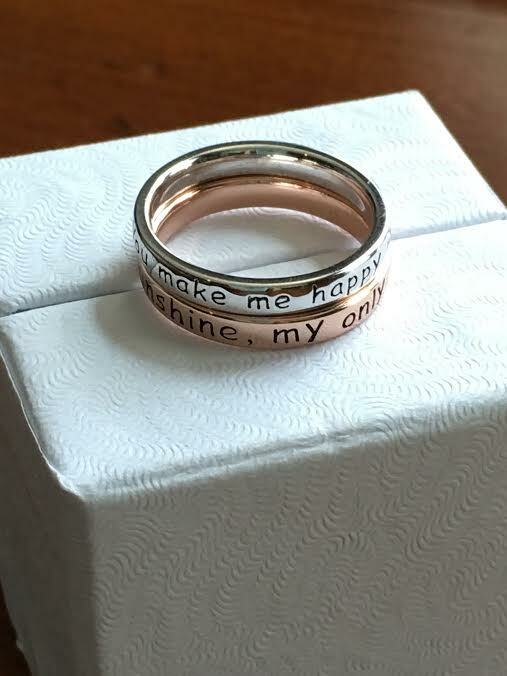 “You make me happy when skies are grey” ring is finished in a high polish. Categories: Message Rings, new, Rings, Stackable Rings. Tags: sterling silver, you are my sunshine, you make me happy.